With a simple philosophy of restoring weary minds, revitalising tired bodies and soothing ruffled spirits, The Berkeley Spa brings the spirit and peace of the countryside to the heart of the city. 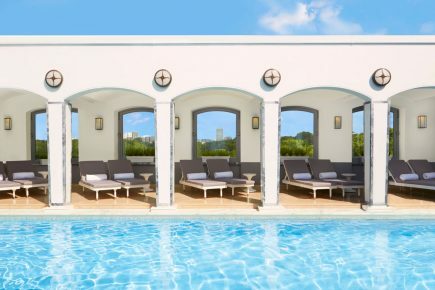 A haven of green and bloom in the most metropolitan of areas, the spa offers an escape from the bustle of city life, proving a secret garden for you to squirrel yourself away in, and a rooftop pool open to the skies in the sunshine. With a range of signature treatments, massages and wraps led by intuitive and highly trained therapists, every extract used is natural, pure and organic where possible and chosen for their lasting results.